McCarran International, Las Vegas, is a medium sized modern American airport much like many others except for many banks of slot machines at every turn! Unlike most other major airports McCarran is very close to the Strip you will have seen just how close as your plane makes its final journey towards the gate with MandalayBay and Luxorseparated form the runway by one road and a fence. If you are arriving on an internal flight you will arrive in terminal 1 getting to your luggage and transport may or may not involve a short ride on a monorail into the main terminal building. Once there you will find a very large but very busy luggage reclaim area (when I was last there in Feb 08 this was being renovated) I have waited over an hour here for luggage but the renovation is aiming to make waits like this a thing of the past. Many of the hotels have check in desks in the reclaim area if your hotel is one of these it’s worth taking the time to check in before claiming your bags. 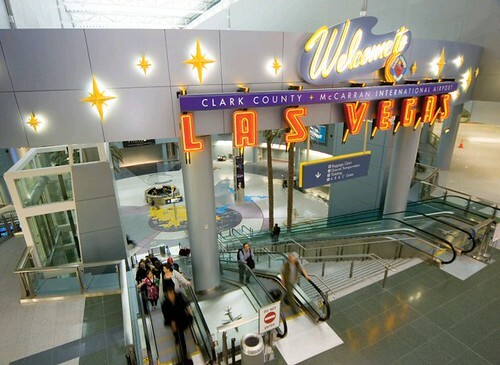 Once you have your bags you can precede towards your transportation towards the strip. International flights arrive at the much smaller Terminal 2 and this does not have the full facilities of Terminal 2 nor does it have hotel check in services. You will clear immigration and customs, collect your luggage (which is far quicker than Terminal 1) and then walk out of the terminal, you will then see the ground transportation options. Basically you have 4 choices of transport (aside from car rental shuttles) Limo, Cab, Shuttle, and public bus.